The Sunday School meets most Sundays in the Parish Hall during the 10am Sung Parish Eucharist during term time. We welcome children from 5 to 12 . Children take part in a wide range of activities including bible stories, art and craft, and games and drama. We rejoin family and friends in church at 10.45 and the children enjoy sharing what they have learnt with the rest of the congregation. At Christmas, the Sunday school enjoys preparing for a very special Nativity play performed in the church on Christmas Eve. 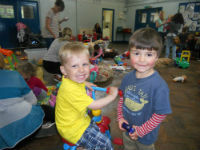 We welcome any new children, whether you are just visiting or a regular attenders. For further details look at the Worship and Music section of this website. Meets in the Church Hall on Wednesday mornings between 10.30 and 11.45. It is open to any Parent/Carer and their pre-school children, and is a great chance to meet with other people. There is no charge for the sessions or for the tea, coffee, juice and biscuits which are prepared by volunteer helpers from the church. You are encouraged to play freely with your child/ren using a range of play equipment. At the end of the morning Father Robert plays his guitar as he leads a very popular singing session. If you would like to see what goes on come along and join us.You will find a warm welcome and good company. The 1st Hanwell Rainbows meet at St Thomas's Church Hall on Mondays from 4.55-5.55pm (before Brownies). Rainbows are aged between five and seven. Rainbows follow a programme called the Rainbow Jigsaw, which has four areas: Look, Learn, Laugh, and Love. This programme helps to develop their self-confidence, build friendships, learn new things and have fun. Girls get involved with arts and crafts, trying out cooking and playing games. We encourage learning by doing. Rainbows work toward their roundabout badges containing activities supporting the Rainbow jigsaw. To add names on our waiting list you need to register on the Girlguiding website, and follow the JoinUs tab. 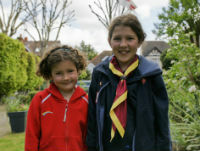 The 10th Hanwell Brownies meet in St Thomas's Church Hall on Mondays from 6:00 to 7:30pm. Brownies are aged between 7 and 10 years old. We welcome girls of all faiths or no faith at all, but we do support the Church in its many events and encourage girls to attend our Monthly Family Parade Services. As part of the 7th Hanwell Scout Group, our Beaver scout colony meets on Tuesday evenings, term time from 5.30 to 6.30pm, directly followed by the Cub pack meeting at the Church Hall. Beaver Scouts is open to boys and girls from 6 to 8 years when they move up to Cub Scouts. It is a uniformed group and the Beavers enjoy gaining a variety of badges, we do craft activities,play games and aim to have fun and for the Beavers to make new friends. There are 3 elements to the Beaver Scout Promise, to do their best, to be kind & helpful and to love God and we try and encourage the children to think about these through a range of activities. We hope that Beavers and their families will support Church events and attend the monthly Family Parade services especially for Harvest Festival, Remembrance and Mothering Sundays. To find more information you can visit the national Scouting website or our local one for Ealing and Hanwell District Scouts. If you would like to put your child's name on the waiting list to join, please email gillshaw36@aol.com with your details. 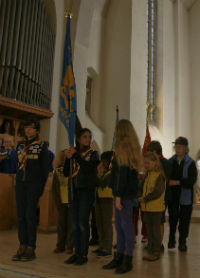 7th Hanwell Cubs meet in St Thomas's Church Hall on Tuesday evenings from 6:30 to 8.00 pm. Cubs are aged between 8 and 10.5 years old. Cub Scouting is open to boys and girls of all faiths and Cubs are encouraged to participate in St. George's Day, Mother's Day and Harvest Services. Cub Scouting is about adventure, about challenging yourself, learning new skills and making new friends. Cubs camp out, light fires, sing songs, make things (other than a mess! ), help people, and even still tie knots, whilst working towards badges and awards in a wide variety of areas. Mostly though, being a Cub is about having fun! If you would like more information, to put names on our waiting list or if you are interested in helping out, please contact Mike Harris (the Group Scout Leader) arris107@virginmedia.com. Please see our Google Maps location and the Getting Around page on the Transport for London website for details of how to find us.